“We felt the movement of the Spirit impelling us to respond with even greater urgency to the cry of our wounded world. As mission partners (lay and sisters), we struggled to find a way to address global issues. We identified the most pressing needs of today as poverty, human trafficking, forced migration, refugees, gender inequality, violence towards women and children and religious intolerance. In our dialogue, our charism and internationality united us in a profound way. Pope Francis in his person, his words and actions is responding to the cry of our wounded world. He is a ‘person centered’ inclusive Pope making contact with people whenever possible, serving lunch to people who are homeless, visiting in neighborhoods experiencing marginalization and poverty, visiting prisoners and having his car stopped to personally greet, embrace, and pray with persons differently abled. His actions – carrying his own bag, driving in a small fiat car, getting up from his chair, and going down steps to greet people are all symbolic actions giving witness to his words and the dignity of the person. because they are incapable of decisive political action. suffer unjustly from the abuses of the environments. They are part of today’s widespread and quietly growing “culture of waste”. This is in stark contrast to our oft quoted phrase “a person is of more value than the world” that informs all our ministry and activism throughout the world. This list has echoes of the list in the Congregational Direction Statement. While Pope Francis did not mention gender inequality and violence against women and children it is implied throughout and the specific violence of sexual exploitation of boys and girls, slave labour, prostitution, drugs and weapons trade, terrorism and international organized crime all impact, wound and enslave girls and women. Pope Francis while often using the words poor or poorest reiterated at least on two occasions that it must never be forgotten … we are dealing with real men and women who live, struggle and suffer, and are often forced to live in great poverty, deprived of all rights. And for the phrase at the end of the next sentence – this is a gem. ‘To enable these real men and women to escape from extreme poverty, we must allow them to be dignified agents of their own destiny.’ Imagine girls and women ‘dignified agents of their own destiny’. I am immediately brought to the words of Philip Pinto and recorded in our direction statement “Transformational leadership is a way of being leaders arising out of the depths of the wisdom within each of us, a wisdom that allows others the space and opportunity to transform their own lives. The only leadership that is worth the name is spiritual leadership”. I was thrilled when Pope Francis named girls when he referring to the right to education as a way of becoming ‘a dignified agent of one’s own destiny’. Pope Francis named the absolute minimum needed to live in dignity – lodgings, labour, land and spiritual freedom which includes religious freedom, the right to education and other civil rights. This absolute minimum has another name Social Protection Floors which Good Shepherds has been promoting over the past few years. Establishing national floors of social protection ensures a minimum standard of living of all people. These pillars of integral human development have a common foundation, which is the right to life! Pope Francis quoted from Laudato Si in referring to the ecological crisis. He issued a sort of warning to Member States quoting from the Charter of the United Nation that the ideal of “saving succeeding generations from the scourge of war” and “promoting social progress and better standards of life in larger freedom” risks becoming an unattainable illusion, or idle chatter which serves as a cover for all kinds of abuse and corruption. Pope Francis continued to make connections between people and planet saying “war is the negation of all rights and a dramatic assault on the environment”. He called member states to uphold the rule of law and to have recourse to tireless negotiation, mediation and arbitration. This is a call to us Good Shepherds to engage in advocacy at national level, seeking implementation of international standards and reporting where we can e.g. Committee on the Elimination of all Forms of Discrimination Against Women (CEDAW), Universal Periodic Review (UPR), Committee on the Rights of the Child (CRC) and, other human right mechanism on implementation or lack thereof. Pope Francis confronted directly the proliferation of arms, especially weapons of mass destruction as opposed to the Charter of the United Nations which desires peace, seeks solutions to disputes and the development of friendly relations between nations. Pope Francis called for the full application of the non-proliferation Treaty, in letter and spirit, with the goal of a complete prohibition of these weapons. Again for the third time Pope Francis uses the word ‘real’ when he says that real human being take precedence over partisan interests. In wars and conflicts it is individual persons, our brothers and sisters, men and women, young and old, boys and girls, who weep, suffer and die. The words of Pope Francis’s address to the United Nations are embedded in our simple yet direct demands to our respective Governments. Pope Francis ended his address saying that the United Nations can be a pledge of a secure and happy future for future generations if the representatives of the States can set aside partisan and ideological interests and sincerely strive to serve the common good. 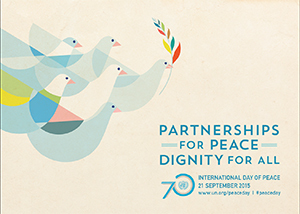 September 21, 2015 International Day of Peace: PEACE BE WITH YOU! The goal and 16 targets are outline. We are currently awaiting the indicators and with regard of means of implementation it begins with the call of the Secretary General as quoted above and cost nothing – lay down weapons – observe a global ceasefire. The United Nations summit for the adoption of the post-2015 development agenda will be held from 25 to 27 September 2015, in New York and convened as a high-level plenary meeting of the General Assembly. 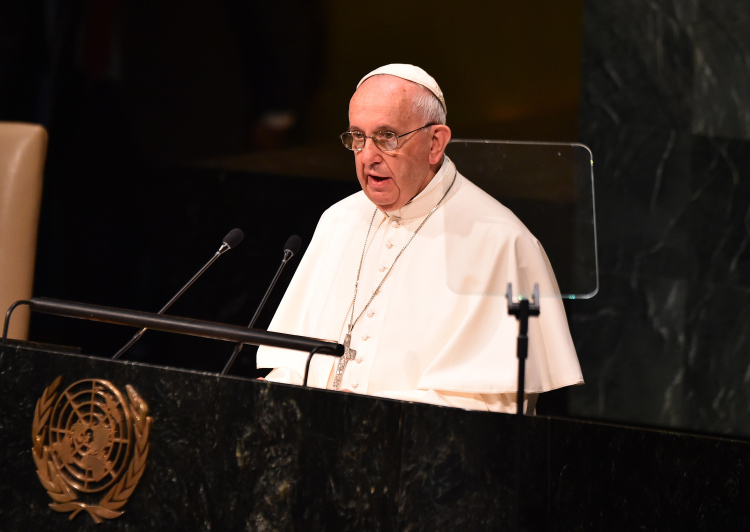 Pope Francis will address the General Assembly on the morning of the 25th of September. What will he say? Have you been following the development and evolution of the 17 Sustainable Development Goals over the past 3 years? What are the 17 Goals? The link to ‘Transforming Our World:the 2030 Agenda for Sustainable Development’ is HERE The document is in all 6 languages of the United Nations. It is a 35 page document providing the framework for the next 15 years. A chart with the list of the goals can be found on page 14. Under each goal there are a number of targets – 169 in all. (See pages 14 to 28). What else is contained in the document? Page 2 to top of page 3: A preamble – People, Planet, Prosperity, Peace, Partnership. Page 32 Paragraphs 72 – 91 Follow up and review. What can you do? I have copied paragraphs 78 and 79 because they make specific reference to the National Level. The bold print is mine. 78. We encourage all Member States to develop as soon as practicable ambitious national responses to the overall implementation of this Agenda. These can support the transition to the Sustainable Development Goals and build on existing planning instruments, such as national development and sustainable development strategies, as appropriate. 79. We also encourage Member States to conduct regular and inclusive reviews of progress at the national and sub-national levels which are country-led and countrydriven. Such reviews should draw on contributions from indigenous peoples, civil society, the private sector and other stakeholders, in line with national circumstances, policies and priorities. National parliaments as well as other institutions can also support these processes. Over the next few weeks follow the local news on the adoption this new global agenda. Is your Head of State attending the UN Sustainable Development Summit? Tune in to the UN Web TV and hear the commitment made by your Head of State. How will this commitment translate at your national and local level? Are you reading Laudato Si – Pope Francis’ encyclical on the environment and human ecology? How does it compare with the Sustainable Development Goals? Inviting you to review the YouTube and respond. What do you think? Kosmos Journal a print and online journal for transformational thinking, policy, aesthetic beauty and collective wisdom has a Facebook page. You can access it HERE A recent post asks ‘If the Sustainable Development goals are based on growth economics will they work?’ The posted YouTube asks some reflective questions. The video clip is entitled Inviting you to share your thoughts.